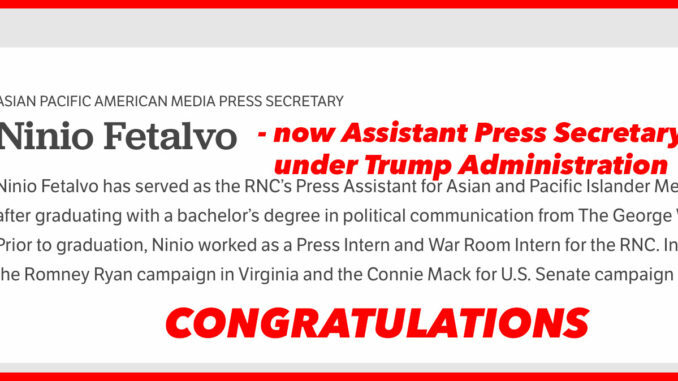 Our congratulations to White House Assistant Press Secretary Ninio Fetalvo. Ninio Fetalvo serves as a spokesman and the Florida Communications Director for the Republican National Committee (RNC). He also serves as the RNC’s Asian Pacific American Press Secretary, where he works to engage Asian American communities across the country with the Republican Party’s message of opportunity for all. During the summer of 2016, Fetalvo served as the Deputy Director of Media Affairs for the 2016 Republican National Convention. Throughout his time at the RNC, he has appeared on several international, national, and local English-language and foreign-language media. In 2014, he helped develop and implement strategic communications for the RNC that contributed to Republicans winning 50 percent of the Asian American vote nationally. In just three years, Fetalvo earned a Bachelor of Arts in Political Communications from The George Washington University’s School of Media & Public Affairs. Born and raised in Southwest Florida, he is the proud son of Filipino immigrants. What was the biggest factor in your success? First and foremost, I have had tremendous support from my family even though a career in politics is not what they had originally intended for me. I’m also grateful to have had the opportunity to work with inspirational and hardworking mentors and colleagues who have continued to push me to do my best in the workplace every day. When I see firsthand so many young people working for our party, it motives me to continue to work in our political process. What advice would you give to other millennials? Take risks and don’t be afraid to reach out to someone asking for career advice. During my senior year of college, I cold-messaged my now-mentor on LinkedIn. He offered me an internship at the RNC, and I’ve been working for the Republican Party ever since. Sometimes, being assertive even if you think someone might not care goes a long way, and you should always be willing to put yourself out there. Does the GOP have a future and why? The Republican Party has done a great job engaging voters from all communities and all backgrounds, and with the help of people in my generation I am confident our party will continue to be party of growth and opportunity for all. The RNC has a strong presence in all communities across the country, which will pay off in dividends beyond this year’s election.